Recently, I received an email by somepony asking for me to try out their game, and included was a nameless (and quite suspicious) .exe file. I launched the game (After virus scanning it over and over and over) and it reminded me almost immediately of the Luna Game. And that's exactly what it was. It is unknown if this game was created by the same person who created the first Luna Game. The music featured is Super Ponybeat - Giggle at the Ghostie. A while ago, a small video demo of a Pony Game Creator popped up and people got really excited, but it quickly died down and was never heard from again. Now, a while later later, it's risen back from the dead. Emily Taylor, creator of the Custom Pony Game, and PonyPonyPonyPony, and her team have been slaving away on this game, and it's looking marvelous so far. 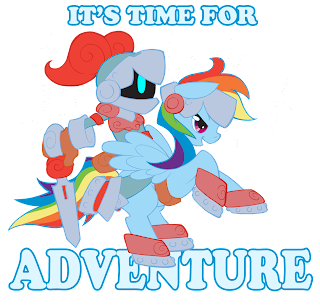 I was invited on the Bronyville, an amazing podcast that I've been listening to for a fairly long while now. I go over a few things about the website, but I forgot to mention graphics. I'm in need of some kind of artist for buttons on the top bar and other things for the website, along with somepony who's willing to make the banner into some kind of game for special view counts adn events. Anyway, check out the show, I had a lot of fun there! Thanks to Apple Cider and Chef Sandy for having me on! And thanks to Sunshine Smiles for looking like Justin Bieber. My Little Pony 3D is a Three-Dimensional game created in blender. This game is currently open source, and editable by anyone. The songs featured in this game are Always, What is Love?, Propane Nightmares, Lux Aeterna, and Bittersweet Symphony. 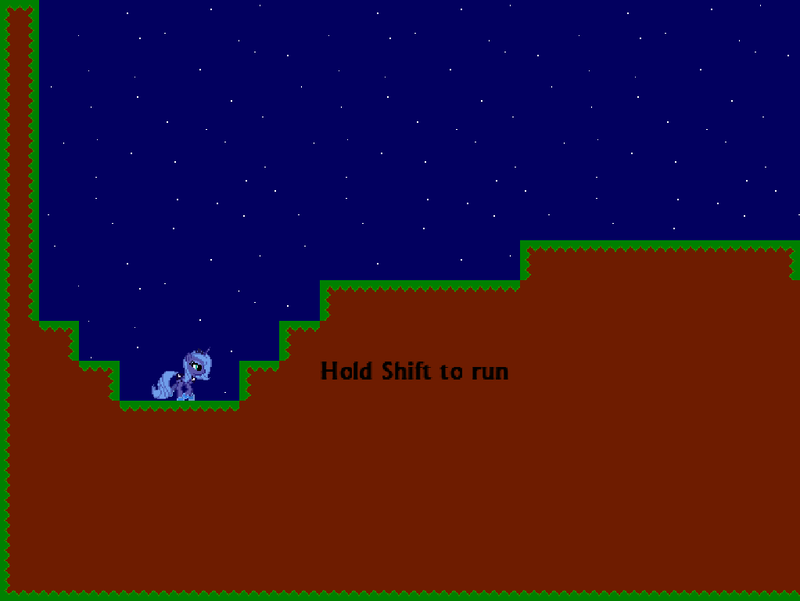 Currently, the game is only an open world sandbox, where you can control a pony and walk around. There is nothing to interact with, and no actual point to this game. The 3D models have a very Nintendo 64 type feel, and they're not bad at all. The controls are your average WASD movement, Shift for running, and F for flying. 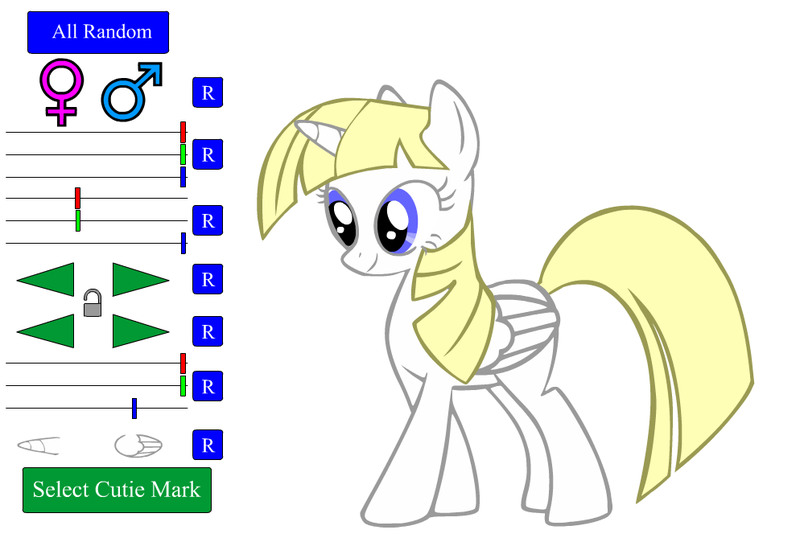 Pressing the numbers 1-6 will spawn different ponies that you can control, and pressing 0 will spawn an NPC that moves around randomly (Applejack only at the moment). The VBNM keys will change the music, BUT BE WARNED, THIS WILL CRASH THE GAME IF YOU ARE ON A 32-BIT SYSTEM. bpskotch is working on creating a My Little Pony and Pokemon crossover game. His comment implies that there is some kind of big boss you will have to fight at the end, someone who your quest will be to defeat. Currently, he is working on adding different ponies and Pokemon in, as of his last journal entry on the 16th he only had 6 ponies and 1 Pokemon completed. He is still currently looking for beta testers, so if you're interested in entering the contest he's holding to become a beta tester, you can check out his DA journal with more info HERE. Sadly, there is not too much information about this game at the moment, but we can expect it to be completed in the near future! So somepony is putting together a 3D My Little Pony game, and honestly it doesn't look half bad. The pony models are actually decent, and the gameplay video actually displays some pretty good controls and physics. So far, the video shows that the world is large, and very explorable. The clouds can very in size, and pegasus are able to walk on them like normal ground. 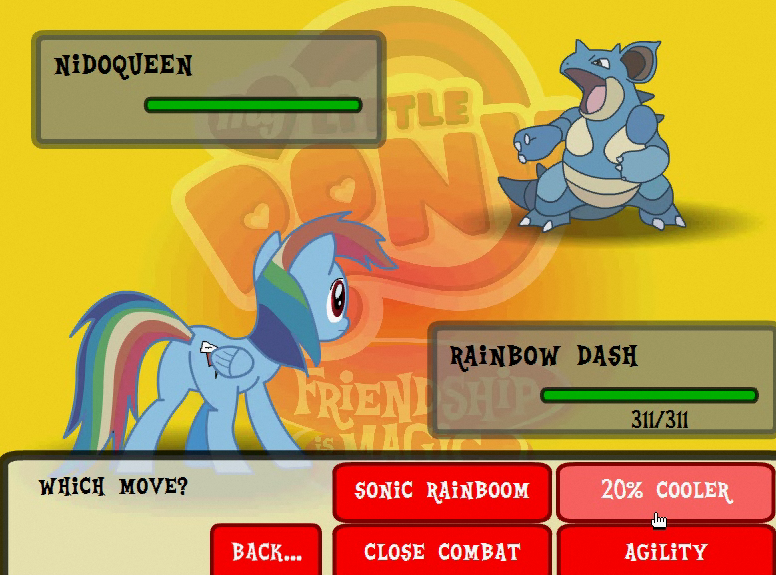 Two playable characters have been displayed; Fluttershy and Rainbow Dash. At this point, the game has no purpose or story of any sort, the only thing you are able to do is fly around. 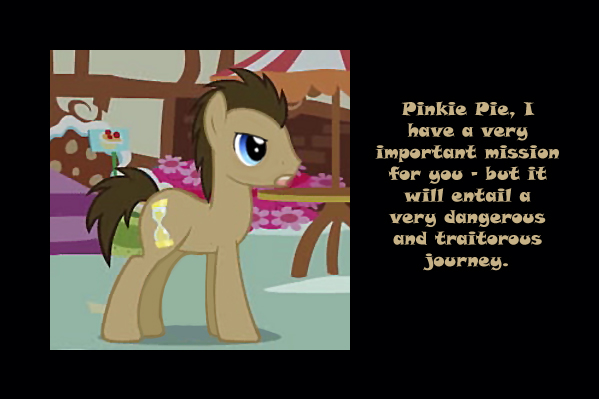 MLP Generator is a simple Pony Creator, made in flash by Shadarack Tailroam. 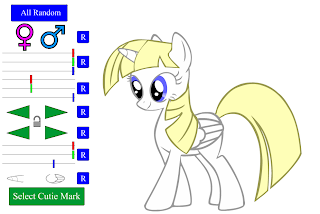 The game has no goal, but it allows you to customize a pony of your own, with 21 different mane and hair styles, your own custom cutie mark, a full color spectrum for mane, hair, and coat, and eye color. You can even choose between male and female, and being an earth pony, pegasus, unicorn, or alicorn. 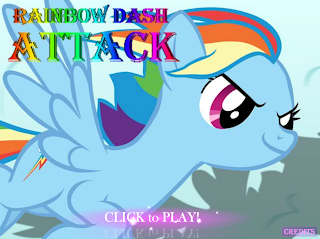 Rainbow Dash Attack is a parody of the widely popular side-scrolling Robot Unicorn Attack. Instead of a robot unicorn, you play as Rainbow Dash. The music featured in this game is Always by Erasure. No gameplay has been changed from the original Robot Unicorn Attack Game, and only a few other things have been reskinned. The game has no story, the only goal being to jump over cliffs, and not run into solid objects in order to make your points reach the highest they can. Collecting the butterfly things will give you point bonuses, along with Dashing into the giant stars. Not too long ago, Actxyn began releasing information about an RPG that he's working on in Flash. The RPG has a typical turn based RPG battle system, much like that of the Final Fantasy series. The game does not have that much information released to the public yet, but the creator is looking for people to join the team, and some music bronies to make him some sweet tunes, or allow access to their existing ones. Well, a long and empty summer looms over the horizon, and what better way to keep yourself busy than hanging out with your fellow Bronies on your favorite MMO? For now, if you wanna find a nice little list, just head over to EqD's article (Provided in the link above). I will have something more for it in the future, we'll see. 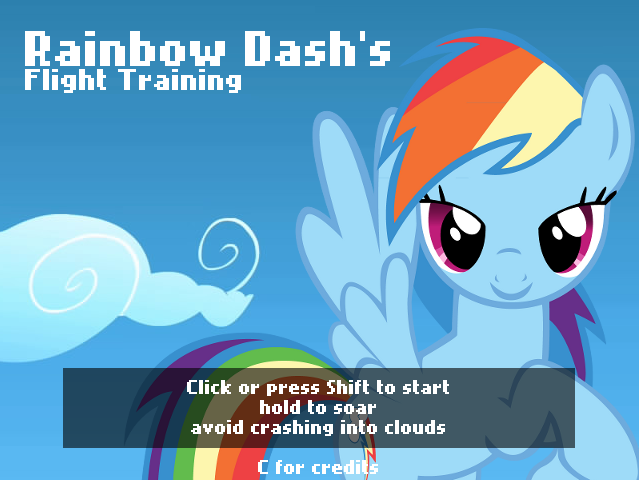 Rainbow Dash's Flight Training is a simple Side-Scrolling game where you play as Rainbow Dash. The game features the song Rainbow Dash Likes Girls (Stay Gay Pony Girl) by Renard. 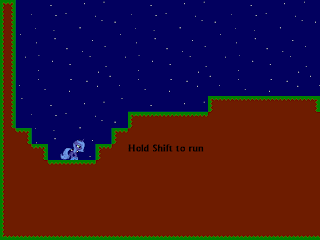 The controls for the game are simple, hold shift/left mouse button to fly higher, and let go to drop. Though the controls are simple, the game itself is actually quite challenging. The game consists of one continuous level, randomly generated each time you start over. The goal is to avoid the clouds on the top and bottom of the screen. Easy, right? 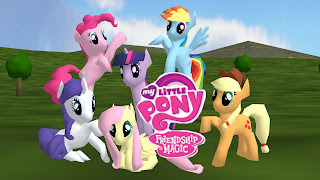 My Little Pony Dress Up (My Little Pony: Friendship is Magic (animal maker)) is a simple dress up game, created by OLa over on Doll Divine. 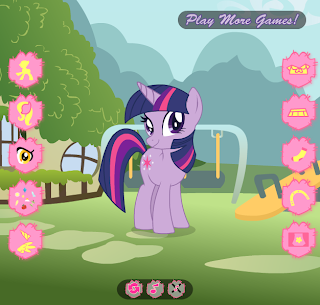 The game itself has no goal or objective, pressing the ten different buttons lined up on both sides of the screen will result in the pony in the center changing. There are ten of each outfit and pony part, including colors and eye types, though the accessories get a little confusing. I WILL RULE THE ENTIRE INTERNET! MWAHAHAHAH!!!! But seriously, thanks everyone for all these views! This means that somewhere around Ten Thousand different ponies around the world have visited this site so far. Now the actual view count at this very moment is 23,492. Shortly I will be switching the counter on the left to total view count instead of unique.